Keep in mind that Jaguar views the all-wheel drive system as one for foul weather and Snow Belt drivers--not for optimizing on-the-road performance. The Jaguar XJ is the plus-size model in the British brand's lineup--but that doesn't make it hefty. Mostly made of aluminum body sections, the XJ has a lighter feel and nimble handling for such a large car--and the daring, charismatic styling to match its manners. This latest XJ demands attention in a way it never had before its 2011 revamp. 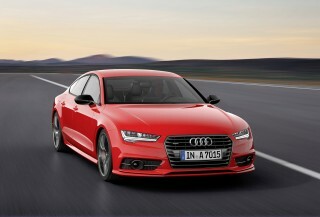 That at last makes it a solid rival to the likes of the S-Class, A8, and 7-Series. Last year, the XJ expanded its appeal with a new V-6 and available all-wheel drive; and now for 2014, a high-performance XJR model rejoins the lineup, for the first time in four model years. Whereas the former XJ was stuck in an era of doilies and high tea, the current XJ drops the need for caffeine entirely. It starts with a fresh, contemporary design, including a drop-dead gorgeous roofline, a sail-away rear pillar, and runway-model sensibilities, from its embossed grille to its bugle-beaded LED taillamps. The rear-end styling can be polarizing; its tucked-in look can look either understyled or delightfully different, depending on your eye. And the endless rings of brightwork inside could have used some censoring--or an option to tone that down a bit. At the base level, the 2014 Jaguar XJ now has a supercharged 3.0-liter V-6 with 340 horsepower. With 0-60 mph times of 5.7 seconds, it's nearly as quick as the supercharged V-8, yet with much better gas mileage (up to 27 mpg on the highway). 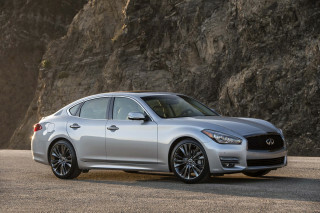 The long-wheelbase model starts with the 385-hp V-8, which is noticeably better to the ears. Otherwise if you jump for one of the upper models--in XJ Supercharged or XJ Supersport models, you'll step up to supercharged 470-hp or 510-hp supercharged V-8s, respectively (and 0-60 in 4.7 seconds for the XJ Supersport. Most V-8 versions are limited to a top speed of 155 mph, but new Sport and Speed packs with new aero tweaks are allowed to venture up to 174 mph. Newly slotted into the top of the lineup is the high-performance XJR, which gets the top-output, 550-horsepower supercharged V-8 from the XFR-S, as well as a stiffer suspension, a front aero splitter, subtle rear spoiler, and various upgrades inside. This model can reach 60 mph in 4.4 seconds and has noticeably sharper powertrain response, with a more rev-happy version of the V-8. Throughout the model line, the engines are mated to eight-speed ZF automatics, and shift quality is quick and smooth (save for too much downshift delay in Drive), with a more performance-oriented shift program in 'S' mode as well as a Dynamic mode that provides sharper shifts and some rev-matching (along with other important changes to the adaptive damping system and stability control). 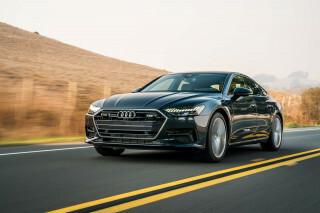 There's also new all-wheel drive with a rear torque bias: it's offered only on the long-wheelbase six-cylinder car, and with a low weight penalty, pits the Jaguar XJ with the long-offered AWD models from Audi, Mercedes, BMW, Infiniti, and Lexus. Jaguar however notes that this system is oriented for foul weather, not top performance. The XJ feels almost shockingly lean and light from behind the wheel, and if you compare it to other German luxury flagships it weighs several hundred pounds less. With an all-aluminum structure, it builds in a deft handling edge, and with this generation, the long-storied ride isolation of Jaguar is history, replaced by an athletic, taut feel. Factor in the adaptive damping system, however, and the electronics manage to filter out minor road imperfections without spoiling any of the fun. Big ventilated disc brakes with anti-lock, brake drying and good pedal feel match the XJ's crisp new feel, and Z-rated tires of up to 20 inches stick tenaciously. Inside, the physical closeness of the XJ's interior makes it feel more sporting. The seats are firmer and flatter, with more adjustments and heating and ventilation, but there's less head and leg room in front and, especially, in back. It's tight at the knees on either side of the front console, but leg room is lavish, especially on long-wheelbase cars. There's one significant letdown, though; that's the limited headroom in back, due to a roofline that's just a bit lower than perhaps it should be. Standard safety equipment is respectable, with six airbags, anti-lock brakes, traction and stability control; there's also a blind-spot alert system built into each XJ, and adaptive cruise control is optional. But items like lane-keep systems, head-up displays, and night-vision systems--optional on the German flagship models--aren't anywhere to be seen here. The 2014 Jaguar XJ, like the competition from BMW, Mercedes-Benz, and Audi, spans a wide pricing range, from about $75k up to more than $150k for some versions. If technology is one of the primary means by which you judge a luxury car, you should probably walk away from the XJ. It's missing the sorts of world-first tech options you'll find on those rivals--and its infotainment and navigation systems are upstaged by vehicles costing a small fraction as much. That said, the XJ lineup will wow you in traditional ways, with unparalleled comfort, plush interior appointments, and stunning trims. The supple semi-aniline leather and real wood veneers go a long way; meanwhile heated front and rear seats, ventilated and massaging front seats, and ventilated rear seats are available on most versions. And with Jaguar's service plan paying for everything except gas and tires for the first five years or 50,000 miles, erasing that worry is an added luxury. Forget the stodgy styling of the former XJ; the current model forever changes our expectations on what a Jaguar should be. Up until a couple of years ago, the Jaguar XJ was surprisingly light and lean, yet hidden within a conservative-looking sedan that, at least visually, held on tight to tradition. It would be hard to go back, given where the XJ has ended up: the shape is so avant garde, you'll want to savor it in its minimalist, clean form and not clutter it up too much with accessories and extra brightwork. We see perhaps a glimpse of influence from the Aston Martin Rapide; otherwise the XJ does everything to discard the past, and to recast its lot with the modern crop of ultra-luxury executive sedans. The rear pillars almost sail out of sight in profile now, while the grille is embossed in sharp form and the fenders swell in sync with the low roofline. 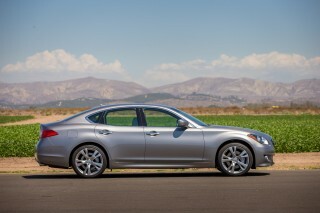 The look is almost without flaw--but we do think that the rear roof pillar is begging for a brished-aluminum surface. 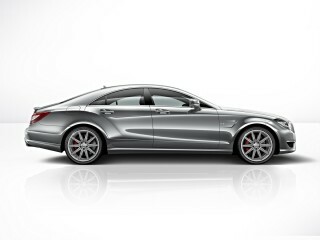 In the past, the first-generation Mercedes CLS struck us as the most French of the non-Gallic four-doors; the XJ's smartly trumped that status. Front and rear end styling in the XJ are remarkably, refreshingly simply. The bracket-shaped LED taillamps call out the spareness of the XJ's rear end: it can seem too spare, or directly inspired by some Citroen greatness. In stark contrast, inside is where the XJ impresses as almost a little too glitzy and over-the-top. It pulls out all the stops, leaving us to wonder if there's even room for customization. The massive glass sunroof drenches the cabin in sunlight, playing up its square feet of wood and chrome. The bubbled-up air vents, the pop-up transmission controller and wide bands of wood on the doors and dash neatly distill the themes of the other Jaguar cars. And there's a soft opulence to the leather headliner, upgraded leather seats, and laser-inlaid wood trim. The only judgment call that we find a little more questionable is the use of piano black trim throughout the dash--something that's as common on Kias as it is Jaguars today. While we're picking nits, the XJ's dash clearly saved time by keeping the former car's structure. We'll admire the efficiency and maybe even swallow the styling line about the big band of wood on the dash echoing the lines of a luxury speedboat, but we're just as inclined to see a lot of Nissan Maxima in the way it's carved out a lot of the old dash's visual heft. If the old XJ was very Jefferson Starship, this is all very Starship: Enterprise. The 2014 XJ takes a step toward more advanced interfaces, and provides what some might see as a little more visual dazzle than is necessary. The gauges and secondary controls all but abandon real dials for a large high-definition LCD screen that displays all the usual functions, while also changing colors subtly to indicate performance driving modes with a soft red glow. There's also an LCD touchscreen that interfaces driver and climate, audio and navigation functions, with some redundancy from real buttons. 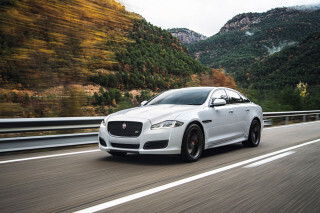 The 2014 Jaguar XJ is surprisingly light and lean, and that makes it quick and satisfying, whether we're talking about the base model or the scorching XJR. The 2014 Jaguar XJ is a strong performer--no matter if you go for the base version with a supercharged V-6, or the scorching new XJR. Those engines and powertrains are great, but are you looking for the reason why the XJ feels quicker and more nimble than it should be? Credit Jag's lighter-weight, jetlike construction, which uses riveted-and-bonded panels, as well as an all-aluminum body structure. Altogether, the XJ hits the scales at about 4,200 pounds in base form--which is several hundred pounds less than other flagship sedans. And yes, it feels like it. The XJ feels almost shockingly lean and light from behind the wheel, and if you compare it to other German luxury flagships it weighs several hundred pounds less. With an all-aluminum structure, it builds in a deft handling edge, and with this generation, the long-storied ride isolation of Jaguar is history, replaced by an athletic, taut feel. Factor in the adaptive damping system, however, and the electronics manage to filter out minor road imperfections without spoiling any of the fun. Big ventilated disc brakes with anti-lock, brake drying and good pedal feel match the XJ's crisp new feel, and Z-rated tires of up to 20 inches stick tenaciously. Throughout the model line, the engines are mated to eight-speed ZF automatics, and shift quality is quick and smooth (save for too much downshift delay in Drive), with a more performance-oriented shift program in 'S' mode as well as a Dynamic mode that provides sharper shifts and some rev-matching (along with other important changes to the adaptive damping system and stability control). 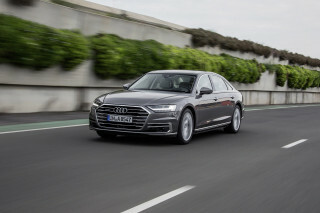 There's also new all-wheel drive with a rear torque bias: it's offered only on the long-wheelbase six-cylinder car, and with a low weight penalty, pits the Jaguar XJ with the long-offered AWD models from Audi, Mercedes, BMW, Infiniti, and Lexus. Jaguar however notes that this system is oriented for foul weather, not top performance. Here, when the selectable Winter driving mode is chosen, a minimum of 30 percent of torque is sent to the front wheels, and up to 50 percent is possible--while the traction control still can modulate power to the rear wheels as grip fades. In most every way, the XJ is a brisk, engaging performer, and its manageable set of electronic add-ons keeps ride and handling more pure than in some of the perpetually-adjustable competition. The XJ goes about its work more directly, with an independent suspension with coils up front and links in back, electronically adjustable air springs in back, and an electronically controlled rear differential on supercharged cars. "JaguarDrive Control," activated by a console-mounted switch, lets owners choose Normal, Dynamic and Winter settings for the throttle, steering, transmission and ride quality. The XJ may have a slightly narrower range of user-selectable performance modes than German or Japanese luxury sedans, but we think it's better for it. Its reflexes are more pure, more predictable, and the overall driving feel is more unified. The modes are related more closely than, say, the settings programmed into Audi's improved Drive Select system. Big ventilated disc brakes with anti-lock, brake drying and good pedal feel match the XJ's crisp new level of responsiveness. And Z-rated tires on 19- or 20-inch wheels stick admirably--though you'll certainly notice the long, storied reputation of Jaguar ride has also been ditched for a taut, athletic feel. Tight rear headroom and glitzy cabin trim are the only hangups for an immensely comfortable interior. The seductive exterior profile of the 2014 Jaguar XJ pulls you in, and you might be so smitten with the look, the feel, and the rowdy engines under the hood that it could take some time to realize that space is surprisingly scarce inside. In the back seat, especially, the roofline takes its toll, and the XJ offers what's likely the most snug fit of any of the premium luxury sedans for those riding in back. It's roughly the same size as the last-generation XJ, at least in overall length and wheelbase, but the body's so radically different and so tapered, there's lots of cubic feet of interior space left under the glass, where passengers don't sit. Those in front won't feel too cramped, though--save for a little constricted feel at the knees due to the wide center console. The seats themselves are firmer and far better contoured and bolstered than they were in Jaguars past. Massage and heating functions are on offer, and they have 20-way power adjustments in front. As we've alluded, headroom is tight in all seating positions in back, where the roofline dips right at the scalps of taller passengers. No matter which model, leg room is decent; and in long-wheelbase models, you get an extra five inches of rear-seat space. Too bad you can't option up a little more headroom, though. One other point worth noting is that the back seat in the XJ feels as well-trimmed and finely detailed as the dash and instrument panel--as opposed to some of the top German flagships, where back-seat appointments can feel rather stark and sanitized. Trunk space is vast, and the trunklid powers open to 18.4 cubic feet, with a flat floor. As for materials and trims inside, there might just be a few too many shiny pieces. Smothered in chrome, wood and leather, the cabin can read achingly gorgeous and slapdash all at once. At the same time, when it's trimmed in striped wood, nothing else in the class comes near its Hollywood Regency-like ambiance. With a body like a Boeing, all-wheel drive on tap, and a respectable list of safety technology, the 2014 XJR should save you from harm. The 2014 Jaguar XJ has most, but not all, of the techiest in-car safety features found in its competitors. All versions have the mandatory airbags and stability control--and in the XJ's case, the stability system has a sport mode that forgives some wheelspin, just in case the driver wants to play around with available grip. For advanced features, the XJ gets a standard rearview camera, which augments a view that's a little compromised by the XJ's big roof pillars. There's also a blind-spot alert system that blinks an alert in the sideview mirrors when cars approach in side lanes. Adaptive cruise control is option, as are automatic and adaptive headlights. What you won't find in the XJ are things like night-vision or lane-keeping systems, features now found on most of the luxury competition. We've given it high safety marks because of its construction techniques--the panels are glued and riveted together for a very strong passenger cell, much in the same way airplanes are constructed. Additionally, all-wheel drive gives the slushy states a realistic alternative to the all-weather versions of the luxest Mercedes, BMW, and Audi sedans. It's offered only on the six-cylinder XJ, though, and only on the long-wheelbase model. The system has a torque bias of 10:90 in normal driving, and 30:70 in its winter mode. It can apply as much as 50 percent of torque to the front wheels while it's sorting out available traction. Jaguar separately notes that this is a system for winter traction, not for additional high-performance in dry conditions--it's a believer in keeping it rear-wheel-drive for that. There are luxury touches throughout the 2014 Jaguar XJ lineup--and plenty of places to splurge--but the navigation system and infotainment feel a step behind. Between XJ and XJL versions, in base and more luxurious Portfolio guise, and with V6, Supercharged, Supersport, and Ultimate levels--and of course the racy new XJR--there are a total of ten 2014 Jaguar XJ models. Just as with the competition from BMW, Mercedes-Benz, and Audi, the XJ spans a wide pricing range, from about $75k up to more than $150k for some versions. Even on the base model, you get power features, dual-zone climate control, and pushbutton start, as well as navigation with voice control; an AM/FM/CD/DVD/MP3/HD/Sirius/30GB hard drive audio system; Bluetooth and a USB port; and a panoramic sunroof. All-wheel drive adds $3,500. Minor functional differences distinguish the nine models in the XJ lineup. Heated front and rear seats are standard on the base model, and ventilated seats are offered as an option, while they're standard on all other models. Four-zone climate control is standard on all versions except the base car. If technology is one of the primary means by which you judge a luxury car, you should probably walk away from the XJ. It's missing the sorts of world-first tech options you'll find on those rivals--and its infotainment and navigation systems are upstaged by vehicles costing a small fraction as much. That said, the XJ lineup will wow you in traditional ways, with unparalleled comfort, plush interior appointments, and stunning trims. The supple semi-aniline leather and real wood veneers go a long way; meanwhile heated front and rear seats, ventilated and massaging front seats, and ventilated rear seats are available on most versions. And with Jaguar's service plan paying for everything except gas and tires for the first five years or 50,000 miles, erasing that worry is an added luxury. Jaguar has dropped its former 1200-watt Bowers & Wilkins audiophile system in favor of a new range of Meridian audio systems, and to our ears, they're purer and less punchy, while saving power versus the old systems. The basic setup is a 380-watt package, with what Jaguar says is output that rivals its old 600-watt base system; an 825-watt system is standard on supercharged cars. To keep the richest buyers coddled, the top versions of the XJ offer new luxury packs with massaging rear seats, power rear seatbacks, heated and ventilated rear seats, and distinctive leather trim. Meanwhile, enthusiasts will be pleased with new Speed and Sport & Speed packs that add red brake calipers, new 20-inch wheels, and adjust the speed limiter to allow a top speed of 174 mph. With a base supercharged V-6, eight-speed automatic, and stop-start, the 2014 XJ is surprisingly fuel-efficient. 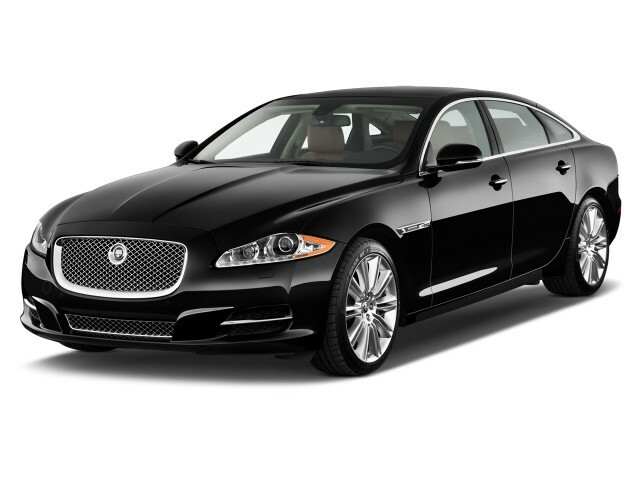 With its lighter-weight body, and the addition last year of a six-cylinder engine, stop/start, and an eight-speed automatic, the 2014 Jaguar XJ delivers reasonably good fuel economy for such a large sedan. The entire lineup now comes with engine stop/start, which smartly shuts the engine off when you're just idling in traffic. It's one of the happier takes on this technology in the automotive universe, cycling on and off with a barely perceptible quiver--although you'll definitely notice the sudden absence of the baritone exhaust note in V-8 versions. 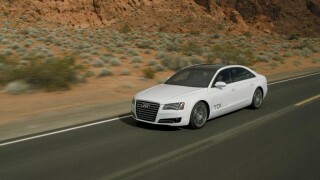 The base supercharged six is pegged at 18 miles per gallon city, 27 miles per gallon highway, or 23 mpg combined. If you add all-wheel drive, whether you're in a short- or long-wheelbase car, you'll drop those figures to 16/24 mpg, or 19 mpg combined. 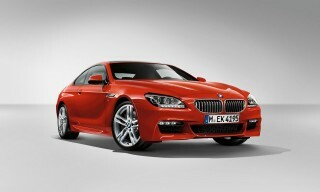 Move up to the normally aspirated V-8, in 385-horsepower form, and you get EPA figures of 16/25 mpg, or 19 mpg combined. Finally, opt into the supercharged V-8s--either the 470-hp or 510-hp, short- or long-wheelbase versions--and gas mileage is 15/23 mpg, or 18 mpg combined, up a single mile per gallon highway from last year's numbers. Fuel economy ratings for the top-performance 2014 Jaguar XJR hadn't yet been finalized at the time of posting; we'll update you with these as they become available.